Winter driving is upon us! 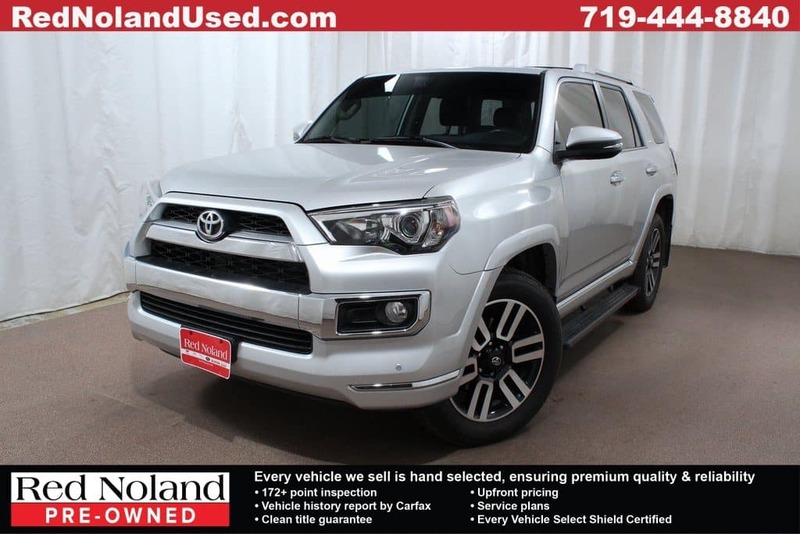 Get to your destination with ease in this gently-used 2014 Toyota 4Runner Limited at Red Noland Pre-Owned in Colorado Springs. This clean four-wheel drive SUV has a third row of seating, offering plenty of passenger room for the whole family. Powered by a 275-horsepower 4.0L V-6 engine, this capable SUV is ready for your daily commute or some fun on the trails! Pamper yourself with a collection of features including a premium 15-speaker Entune JBL audio system, Luxury Package, navigation, rear parking camera, brake assist, power tilt/slide moonroof, heated/ventilated front memory seats, unique 20-inch dual-spoke alloy wheels and much more! Priced at $29,999, this beautiful pre-owned 2014 Toyota 4Runner is a great value. Well-qualified buyers can finance this roomy four-wheel drive for as little as $393 per month (with approved down payment). Stop in to Red Noland Pre-Owned, conveniently located just off I-25, for your test drive today!